Harnessing the power of the herd migration - how to use electric fences as the steering wheel, brake, and accelerator to control your most powerful farm tool - your grazing herd. 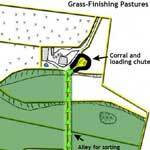 The 3-dimensional farm plan - how to use your cattle fence layout to create your grass-fed production plan. 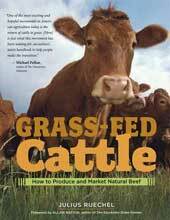 Training cattle to electric fences - create effective psychological barriers in the minds of your cattle. This article series explains how to use a combination of permanent and portable electric cross-fences to create the simplest, most efficient, and cheapest cattle fencing solution. 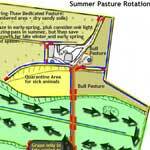 This example farm plan showcases the complete infrastructure and year-round grazing management of a cattle ranch, from cow/calf to grass-finished. Tips for drawing your cattle management farm plan - Handy tips on how to plan your electric cattle fence installation and grazing strategies using map layers. Dealing with existing cattle fences - Fence planning advice for farmers with pre-established infrastructure. Swivel-Lock Insulators - How to create instant temporary gates anywhere in your electric cattle fence grid. 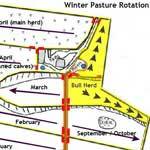 Calving on pasture - how to set up and manage your electric fencing grid and pasture rotation for calving on pasture. Test your electric fencing skills!